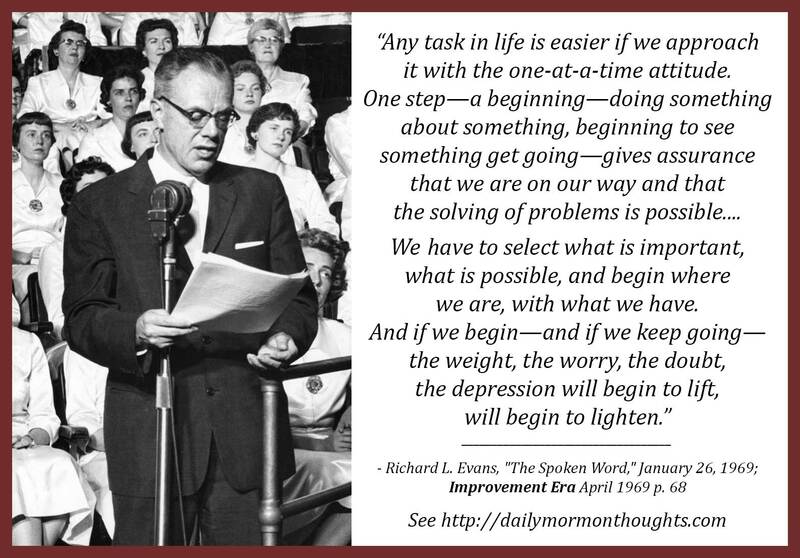 Elder Richard L. Evans (1906-1971) served as a Seventy from 1938-1953, when he was called to the Quorum of Twelve Apostles. 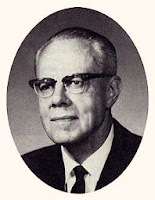 He died in 1971 at age 65. He was known as "the voice of the Tabernacle Choir" from the beginning of its broadcasts in 1929 until his passing. "There are times when all of us feel overburdened, with debts, with obligations, so many things undone, so many undone things to do—worries, problems, and sometimes our share, it seems, of sorrows. And we wonder how we can be everywhere we ought to be, do all we ought to do, meet the obligations, and carry the weight of our worries, as we seem to divide ourselves in too many different directions, too many ways at once—not feeling that we are completing or disposing of or quite in control of anything—just a reshuffling of papers, a reshuffling of problems. "Any task in life is easier if we approach it with the one-at-a-time attitude. One step—a beginning—doing something about something, beginning to see something get going—gives assurance that we are on our way and that the solving of problems is possible. To cite a whimsical saying: 'If you chase two rabbits, both of them will escape.' No one is adequate to everything all at once. We have to select what is important, what is possible, and begin where we are, with what we have. And if we begin—and if we keep going—the weight, the worry, the doubt, the depression will begin to lift, will begin to lighten. "We can't do everything always, but we can do something now, and doing something will help to lift the weight and lessen the worry. 'The beginning,' said Plato, 'is the most important part.'" The great key to life is, "We can't do everything always, but we can do something now, and doing something will help to lift the weight and lessen the worry." Just finding something to do, something to accomplish, somewhere to begin on the first task—those simple first steps provide the momentum to continue and conquer. Labels: actions, attitude, busy, challenges, Evans Richard L.